Vima Nyingtik (Tib. བི་མ་སྙིང་ཐིག, Wyl. bi ma snying thig) 'The Heart Essence of Vimalamitra' — one of the 'Four Sections of Nyingtik' (Nyingtik Yabshyi). The first four masters in the lineage left this world in a characteristic way. At the end of his life, the first human Dzogchen master Garab Dorje disappeared into a sphere of rainbow light, leaving his disciple Manjushrimitra his last testament Hitting the Essence in Three Words, Tsik Sum Né Dek. When Manjushrimitra departed from this world, vanishing in a cloud of light, he gave his last testament to his disciple Shri Singha, entitled Six Experiences of Meditation, Gom Nyam Drukpa. When Shri Singha passed away and dissolved into a body of light, he bestowed his testament Seven Nails, Zerbu Dün, on Jñanasutra. He too left this world by disappearing into a sphere of light, leaving his disciple Vimalamitra his own testament Four Means of Abiding, Shyak Tab Shyipa. The lineage which passed from the primordial buddha Samantabhadra through Vajrapani or Vajrasattva to the vidyadhara Garab Dorje is known as the Mind Direct Transmission of the Buddhas — Gyalwa Gong Gyü. From Garab Dorje down through Manjushrimitra, Shri Singha and Jñanasutra to Vimalamitra, the lineage is known as the Sign Transmission of the Vidyadharas — Rigdzin Da Gyü. Then from Vimalamitra onwards, the lineage is called the Oral Transmission from Special Individuals — Gangzak Nyen Gyü. These are the three transmissions according to the tradition of Vimalamitra. Within the Innermost Secret Cycle of Nyingtik are the Seventeen Tantras. The tradition of Vimalamitra adds to them the Tantra of the Wrathful Mother, Protectress of Mantras, to make eighteen in all, while the tradition of Padmasambhava also arrives at a total of eighteen by adding the Tantra of the Blazing Expanse of Luminosity. Generally, however, both the Tantra of the Wrathful Mother, Protectress of Mantras, from Vimalamitra’s tradition and the Tantra of the Blazing Expanse of Luminosity from Padmasambhava’s tradition are added to the Seventeen Tantras of the Innermost Secret Nyingtik Cycle, making a total of nineteen altogether. In Tibet, the ones who made this Nyingtik teaching of Clear Light spread were the great masters who possessed their special direct transmission, chiefly the great pandita Vimalamitra, and Guru Padmasambhava. In the room known as Ütsé Barkhang in Samyé, Vimalamitra gave the cycle of the Innermost Secret Nyingtik of Dzogpachenpo in strictest secrecy to five disciples: the king Trisong Detsen, Nyangben Tingdzin Zangpo, prince Mune Tsepo, Kawa Paltsek and Chokro Luyi Gyaltsen. The tradition of Nyingtik which came down from this transmission is known as the Vima Nyingtik. The Vima Nyingtik itself can be categorized into tantras, agamas, and upadeshas, which are all taught within it. The tantras here refer to the Seventeen Tantras of the pith instructions. The agamas found in the Vima Nyingtik are the golden lettered instructions, the turquoise lettered instructions, the copper lettered instructions, and the conch lettered instructions. These are what are called the ‘four volumes of profound instructions’. Then the upadeshas refer to the 119 treatises of essential pith instructions. Vimalamitra spent thirteen years in Tibet, and then, promising to return to Tibet every hundred years as an emanation to further the Clear Light teaching of Dzogpachenpo, he left for the Wutai Shan mountain in China. There he remains, in the rainbow body, the ‘Body of Great Transference’, and there he will remain until all of the 1002 buddhas of this Fortunate Kalpa have appeared. When they have all done so, he will once again go to Vajrasana in India, where he will manifest the state of complete and perfect enlightenment. Fifty-five years after Vimalamitra’s departure for Wutai Shan, Nyangben Tingdzin Zangpo, having given the transmission of the Vima Nyingtik cycle to Bé Lodrö Wangchuk, attained the rainbow body. Bé Lodrö Wangchuk gave the pith instructions cycle of Nyingtik to Dangma Lhundrup Gyaltsen, who in turn passed it on to Chetsün Sengé Wangchuk. He transmitted it to Gyalwa Shyangtön Tashi Dorje, and then left this world in a rainbow body. Gyalwa Shyangtön passed it on to the great siddha Khépa Nyimabum, who gave the teachings to his principal disciple Guru Jober. 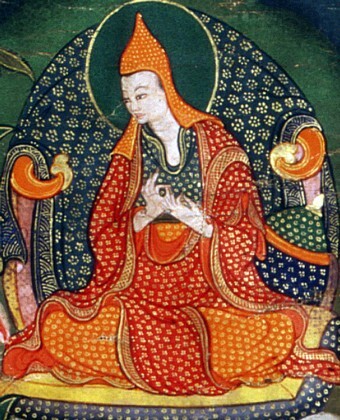 Then Guru Jober transmitted them to Trulshik Sengé Gyabpa. He in turn gave them to the great siddha Drupchen Melong Dorje, who passed them on to Rigdzin Kumaradza. Kumaradza gave the teachings to the Omniscient Longchen Rabjam, and so this is how the lineage flowed down to the Omniscient Longchenpa, who was born in the year 1308. In terms of what are called the ‘old’ and ‘new’ Nyingtiks, the Vima Nyingtik came to be known as the old Nyingtik, and in terms of kama and terma, it was classified as kama. This is how it is popularly defined. The Vima Nyingtik is also called the ‘mother text’ (ma yik). ↑ Wyl. gser yig can. ↑ Wyl. g.yu yig can. ↑ Wyl. zangs yig can. ↑ Wyl. dung yig can. Nyoshul Khenpo, A Marvelous Garland of Rare Gems: Biographies of Masters of Awareness in the Dzogchen Lineage (Junction City: Padma Publications, 2005), Part I, Chapter 4, 'The Lineage of Vimalamitra'. This page was last edited on 2 September 2018, at 13:01.